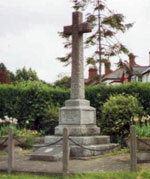 The memorial is located at the corner of Hucclecote Rd. and Green Lane in Hucclecote, Gloucestershire, England. Listing and photograph taken in 2007. Flight Engineer Sergeant Trevor Jones. Died in December 1942, aged 19. During a routine navigational training flight the aircraft encountered severe turbulence at 23,000 ft. above Carmarthenshire. He was injured whilst parachuting from the stricken aircraft. The other three aircrew bailed out and survived. Enemy action in the Parish. The memorial includes a commemoration to seven people, including the HENDERSON family, who lost their lives when a bomb fell on a shop and houses in Hucclecote road on Easter Saturday, 4 April 1942. The area is near to the Royal Oak pub, and is now occupied by a small parade of shops. The HENDERSON family consisted of James and Beatrice and their children, 3 years old Jean and 10 months old Joyce.